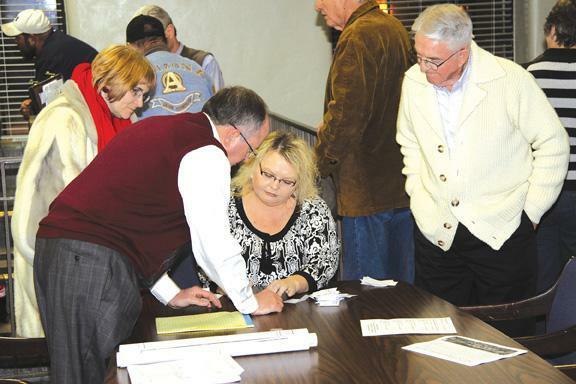 County Executive Mike Gannon, left, and IDB member Dean More watch as Melissa Markum compiles the votes conducted at the end of Thursday’s meeting. The southern route won. Watching is LuAnn Curlee. A surprise suggestion by one Woodbury resident threw the public hearing on state Route 70S into disorder. Dean More, a member of the county's Industrial Development Board, suggested toward the end of the session that those in attendance vote on the various suggestions. To the surprise of County Executive Mike Gannon, More had already drawn up some ballots on the issue. A number of those in attendance did vote. The southern bypass got 18 votes, while going through the middle of town got 12 votes. The northern bypass got only 5 votes in favor. Other participants did their own thing with 5 voting to "do nothing." One undecided vote was cast and two voters choose the option of voting after an impact study is done. Gannon pointed out that the vote wasn’t binding in any way and he wasn’t sure if it was a good idea. “We don’t want the public to think any action was taken,” he said.